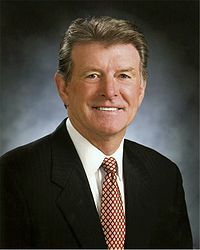 Clement Leroy "Butch" Otter (born May 3, 1942 in Caldwell, Idaho) is the current Governor of Idaho and a member of the Republican Party. Previously he served as a U.S. Representative from Idaho's first congressional district from 2001 through 2007 and Lieutenant Governor from 1987 through 2001. He is a graduate from St. Teresa’s Academy and received a Bachelor of Arts degree in Political Science from the College of Idaho in 1967 and later was awarded honorary doctorates from the University of the Philippines and the College of Idaho in Caldwell. Otter would go on to serve in the Idaho Army National Guard. Butch Otter spent the next 30 years working in the private sector at Simplot International, a major food production business. He would rise to become Director of the Food Products Division, President of Simplot Livestock, and President of Simplot International. He retired after getting elected Lieutenant Governor and would go on to serve in that office longer than anyone in Idaho history, serving under two Republican governors and one Democrat. He was elected to the U.S. House of Representatives in 2000 and easily reelected in 2002 and 2004. Otter's record was more libertarian than conservative. He voted against the Patriot Act and against terrorist surveillance, while was solidly conservative on economics. Butch Otter is pro-life, earning a 100% rating from the National Right to Life Committee. Additionally he received an A from the National Rifle Association. In 2006 Otter was elected Governor of Idaho with 53% of the vote. This page was last modified on 5 December 2017, at 12:45.